POWER CLEAN Industrial Spray Wash Cleaning Systems are locally manufactured in India. Our Industrial High-Jet Spray cleaners are manufactured with High Quality. These Spray Cleaning Systems can be customized to meet customers needs. Where can I use hi jet spray cleaning system ? High Pressure cleaning machines are very effective in removing Oil, Grease, dust e.t.c from components in a very short time. These systems are usually cheaper than utlrasonic systems and easier to maintain. Jet Spray parts washing machines are customized based on customer requirements. 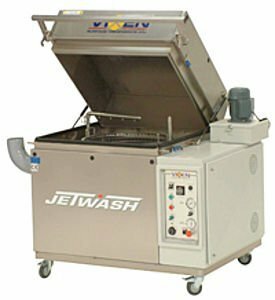 The Jet Wash parts washer is a rugged, automated, single-stage cleaning system for small parts. The high-pressure spray system operating in conjunction with a rotating work basket provides thorough cleaning of a wide range of parts and contaminants, making the hot wash ideal for water-based parts degreasing & cleaning in manufacturing industries. The Jet Spray parts washer is ideally suited for use with the complementary range of ‘POWER CLEAN’ biodegradable aqueous industrial degreasers and cleaner. Please Note : We have shown only few selected models. We also have few more additional models that are not shown here. We also work with the customer to offer customized Hi Jet Spray cleaner based on customer requirements.